The humble fridge is a necessary part of any home and in different stages of life there might be a need to invest in a new one. The end of financial year sales time provides a great opportunity to consider an upgrade with retailers keen to sell-off their current stock to make way for the new stuff. This means you could just bag yourself an absolute bargain! Where can you find the best deals? Read on for our guide to fridge sales this EOFY. Aussie households spend an average of just over $1,100 on new fridges. For this price you can generally expect to find the standard 450L family-sized fridges, with a bottom or top mount design. You might be lucky and also find some brands offering the large side-by-side fridges in this price category during the sales time. Some of the brands that do well in our annual ratings include Kelvinator, Hisense, Fisher & Paykel and Haier, so read on to find out what they have to offer this year. A brand that generally offers great value for money is Kelvinator. The trusted brand has been operating for over 80 years and has a decent range of fridges, which typically include mid-large size capacities. 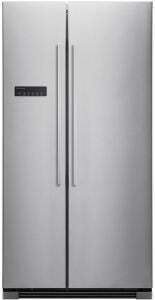 This 528L Kelvinator fridge ($1,549 RRP) is best-suited for medium to large-size households. The bottom mount unit design aims to limit strain on your back, which is typically caused by constant bending down with top-mount fridges. The freezer section is equipped with wire baskets to organise your food, plus an additional flat section at the top to store items such as frozen pizzas and ice trays. It’s equipped with several handy features such as a door alarm for when the door is left open, ‘Spillsafe’ glass shelves to capture any liquid in the event of a spill, and a ‘FlexStor’ door bin storage system that enables you to configure the fridge door to suit your family. There is also separate temperature controls for the fridge and freezer units. In terms of energy efficiency, the Kelvinator 528L fridge has a rating of 3.5 stars out of five and could add around $122 to your annual electricity bill (according to the Standard Test, based on a usage rate of 29c/kWh). If you’re looking for a straightforward fridge without any unnecessary bells and whistles, you might like to consider this Artic Silver 540L fridge with a charcoal grey cabinet finish and pocket handles ($1,549 RRP). It has a slightly larger fridge capacity and features a top mount design that gives easy access to the frozen items. It’s also equipped with a humidity-controlled crisper – designed to help extend the life of your fresh fruit and veggies. Expect similar features as the 528L model, including separate temperature controls for the fridge and freezer, plus the Spillsafe glass shelves and FlexStor door. It has a 3.5 star energy efficiency rating and in turn can be found to use around the same amount of energy as the previous model – $121 per year. 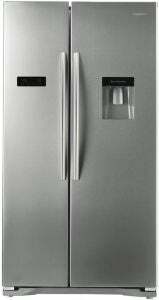 Hisense has a number of fridges on offer, ranging from the small 200L varieties to the large French door designs. While you might not find any ‘super green’ fridges with Hisense, scoring low energy star ratings, this goes for many other cheap fridge brands on the market. Nevertheless, there is still credit to Hisense fridges, being equipped with a variety of features at a reasonable upfront price. The Hisense HR6BMFF435SD fridge ($999 RRP) is best-suited for medium-sized or growing families. With this Hisense design, you can expect the standard spill-proof glass shelves, easy-slide drawers and a fruit and veg crisper. Some of the more advanced features include a multi-function touch control panel that allows you to select from a number of settings. 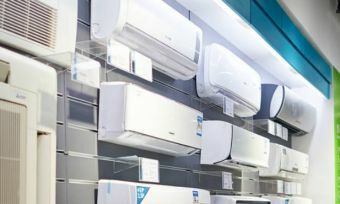 Other design features include the ‘Multi-Air Flow’ system, which is boasted to provide consistent cold air distribution throughout each compartment and the ‘Super Cooling’ and ‘Super Freezing’ modes, aimed to provide cooler temperatures, faster. Additionally, it’s equipped with a ‘Holiday Powersave’ function to help reduce energy wastage while you’re away from home. It has a 2.5 star energy efficiency rating and could add around $142 to your energy bills per year. 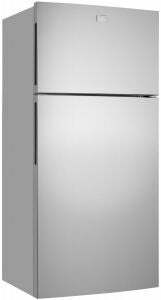 This large 610L HR6SBSFF610SW Hisense fridge has a recommended retail price of $1,299, but can be found for $1,096. The side by side fridges tend to be a popular choice among large family households, offering well-organised storage space with easy access for everyone. The Hisense side by side fridge has a straightforward design with most of the standard features you’d expect from a fridge at this price such as the ‘Spillsafe’ glass shelves that can be adjusted to different heights and humidity-controlled crisper drawers. Another feature of this design is the chilled water dispenser mounted to the fridge door that’s fed from a tank on the inside, meaning it doesn’t require any plumbing or specialist installation. This Hisense fridge is also equipped with specialised cooling settings including a ‘Super Freeze’ mode, boasted to rapidly lock in the freshness of groceries as soon as they’re brought home, plus a ‘Holiday Powersave’ mode to minimise the fridge’s use of electricity while you’re away. Similarly to the model above, it only has a 2.5 star energy efficiency rating, and according to the standard test, will add $175 to your annual electricity bill. Fisher & Paykel competes with the likes of Hisense and also offers a wide array of fridges. It focuses on innovation and forward thinking, and while you typically won’t find many Fisher & Paykel fridges priced under $1,000, you might score some great discounts at the EOFY sales. 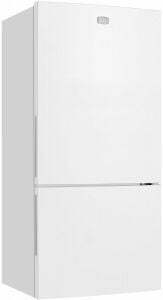 This 411L unit from Fisher & Paykel ($1,799 RRP) is most suited for a household of three to four people. Its standard design features include adjustable door shelves, three adjustable glass shelves, two ice trays and fruit/vegetable bins. It also uses LED lightening to illuminate fridge contents. It’s also equipped with concealed hinges, sleek side mounted plastic handles and an EZKleen stainless steel finish. The fridge boasts a number of interesting features, including the ‘ActiveSmart Foodcare’ and adaptive defrost. It’s aimed to adjust airflow inside the fridge to maintain a stable and even temperature, stating there’s no need for ‘holiday mode’ settings. The ActiveSmart system is claimed to select the best time to defrost based on how the appliance is being used, so it recognises lower levels of use and defrosts less often, thus using less energy. This Fisher & Paykel top mount fridge has three stars for energy efficiency, costing around $118 in energy per year. The Fisher & Paykel RX628DX1 628L has a recommended retail price of $2,599, but can be found for just under the $1,500 mark. It’s designed for a large family, so ensure you have sufficient kitchen space for this 628L fridge as well as ventilation room. The design features plenty of space including six adjustable glass shelves, deli storage, three freezer bins, five freezer door pockets, two fruit and vegetable bins and five full width door shelves. The electronic control panel on the freezer door allows you to select from a number of settings, as well as set the temperature for both the freezer and fridge unit. Unlike the model above, this RX628DX1 does feature a holiday mode, claiming to optimise fridge energy use while you are away. It’s also equipped with an air circulating fan, Fast Freeze & Max Cool modes for rapidly locking in food freshness as soon as you get it into the fridge. It has scored just two stars for energy efficiency and will add around $180 to your electricity bill per year. It’s available in either a stainless steel or white finish. Hair aims to provide stylish and innovative designs at fairly affordable prices. It has an extensive range of refrigerators from bottom mount and French door, to top mount and vertical style fridges. With Haier, you can score a fridge for under $500, offering several budget-friendly options in its current line-up. The Haier 222L top mount fridge ($699 RRP) is suitable for small households. It’s important to keep in mind that with the lower upfront cost, it does come with a low energy star rating of 2.5 stars. In terms of annual running costs, it should add around $98 to your power bill each year. That might seem less than some other models listed above, but keep in mind… it’s a very small fridge in comparison. There are a number of features that this humble fridge comes with, including Haier’s frost free system, boasted to keep power consumption steady, as well as limit odours in the fridge and stop frozen foods from sticking together. The Vitamin C fresh filter system is claimed to help prolong the lifespan of food, while the LED tower lighting is stated to provide greater energy efficiency and emit less heat than more traditional light bulbs. For a larger fridge, you might like to consider the Hair 462L French Door model. It has a recommended retail price tag of $1,499, but you might be able to score it for just over $1,000 at the end of financial year sales. It’s stated to have a finger-mark resistant brushed silver finish with recessed handles and hidden hinges, for a clean look. It features an arrangement of shelves and drawers to help keep your fresh and frozen food and drink well-organised. Expect full-width glass fridge shelves, two separate drawers in the freezer section, plus a ‘My Zone Drawer’ that’s boasted to provide separate space for storing vegetables, drinks or meats, simply by adjusting its sliding control. The external electronic controls allow you to set the fridge and freezer temperature, as well as program the child lock. It has a ‘Holiday’ mode for energy-saving and ‘Super Freeze’ mode for quickly freezing food as soon as you put it in. In terms of energy efficiency, it has a 2.5 star energy rating and according to the standard test, you’re likely to pay around $149 per year with this appliance. Should you buy a new fridge this EOFY sales time? If your current fridge isn’t meeting your needs – for example your family has grown and you need more capacity or possibly the kids have moved out and a smaller fridge might help reduce on electricity costs – then you might like to consider looking out for a bargain at this time of year. It’s important to consider energy efficiency star ratings, as well as fridge capacity, to ensure you’re buying the right fridge to suit your household. There’s plenty of choice, so shop around before you settle on one.